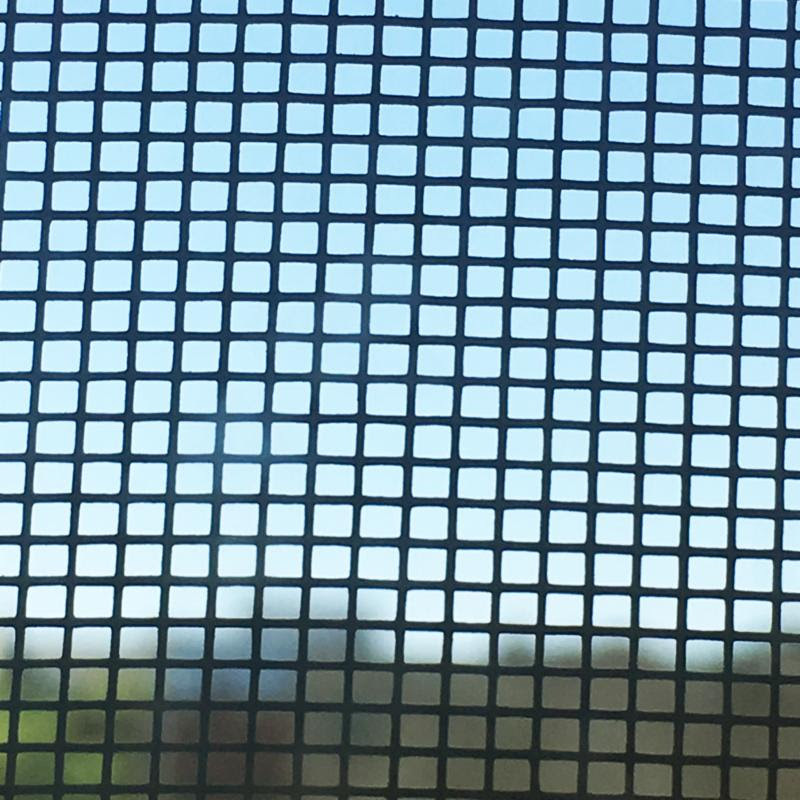 A screen door allows circulation: of air, light, conversation. It is a porous boundary, used to mark the transition between inside and out, the personal and public. In the South and beyond, the screen door, like the porch, is a social mediator. It exposes the home to the neighborhood, while still maintaining a veil of privacy. In summer's heavy heat, it is of the utmost importance. The four painters in this exhibition have set up a screen, a scrim, a partition in their paintings that allows them to operate within the exterior, coaxing out the mercurial habits of painting behind a seemingly sound surface. Ann Craven has appropriated images of bird photography to deconstruct ideas of duration and seriality. Using a tropical palette mixed on another canvas, Craven renders the birds as iterations of themselves, as if they were photographed in a high-speed burst like Étienne-Jules Marey. But instead of being captured in the swift applause of flight, they sit so still they might as well be taxidermied. After the bird is painted, leftover paint is applied in minimalist swaths of colors on another canvas of the same size. Finally, the palette painting is displayed as well. These three accumulations of paint on canvas playfully question notions of materiality and representation, asking the viewer to look past what has been painted in order to see the act of artmaking itself. In her densely layered paintings, Dana Frankfort investigates the liminal zone between language and sight. Beginning with a word, not so much as a linguistic prompt, but as a dissociated point of departure, she lays down washes of oil. As the surface thickens, forms overlap, colors adulterate. The surface is sanded down. She starts again. The result has no clear relation to the semiotic starting place, and any attempt to connect the word with the work is bound to frustrate: a perfect allegory for chasms between observation, thought, and language. EJ Hauser's singular compositions tumble through categorization. The determined, though indeterminate line work seems both pixelated and prehistoric as her pictographic subject matter shapeshifts from landscape to still life to figure to back again. In a similar circulation, her finished paintings seem like inspirations for their own preparatory sketches. Hauser locks the eye in a whirling cycle of chance and causality, dodging expectation at every turn. Margaux Ogden paints on raw canvas, undercutting her exacting compositions with a delicate, hand-drawn touch. Each painting is a performance in which there can be no false steps; nothing can be painted over, nor redone. As such, she walks a thin stage between the material backdrop of the canvas and the art-historical barricades of geometric abstraction and minimalism. Here, she refreshes the dogmas of nonrepresentation with a liberating breeze. Ann Craven lives and works in New York City. Karma Books recently published a 560-page monograph of 20 years of Craven's paintings. Craven has exhibited widely, including Karma, New York (2018); Nina Johnson, Miami (2018); Southard Reid, London (2017); Maccarone, New York (2017); Hannah Hoffman Gallery, Los Angeles (2014); the Green Gallery, Milwaukee (2013); Galerie Perrotin, Paris (2013); White Columns, New York (2013); Eva Presenhuber, Zurich (2013); Gladstone, New York (2012); and Marianne Boesky, New York (2012); Time, curated by Yann Chevalier at Le Confort Moderne in Poitiers, France (2014); Shadow's Moon and Abstract Lies,curated by Florence Derrieux and Francois Quintin, at Le FRAC Champagne Ardenne in 2008. Craven's work has been reviewed in publications including the Los Angeles Times, Art in America, the New York Times, Artforum, Flash Art, the New Yorker, Frieze and Modern Painters. Her paintings are in the public collections of the Museum of Modern Art, New York; the Whitney Museum, New York; the New Museum, New York; and the Museum of Contemporary Art in Chicago, among others. Dana Frankfort received a BA in Art History from Brandeis University in 1995 and an MFA from Yale University in 1997. She attended the Skowhegan School of Painting and Sculpture, also in 1997. From 1999-2000 Frankfort was an Artist in Residence at the Core Program, Museum of Fine Arts, Houston. One-person exhibitions include: Southwest School of Art, San Antonio (2018); Inman Gallery (2012, 2010, 2007); James Harris Gallery, Seattle, WA (2011); Sorry We're Closed, Brussels (2008); Bellwether Gallery, New York, NY (2007); and Kantor/Feuer Gallery, Los Angeles, CA (2006). Her paintings have been included in the group exhibition Abstract America: New Painting from the U.S., Saatchi Gallery, London (2009-10); and locally in Learning by Doing: 25 Years of the Core Program, Museum of Fine Arts, Houston, TX (2008-09). Frankfort received a John Simon Guggenheim Memorial Foundation Fellowship in 2006. Her paintings are in the permanent collections of the Museum of Fine Arts, Houston, Rice University, Houston, St. Edward's University, Austin and The Jewish Museum, New York. Frankfort lives and works in Houston, TX. EJ Hauser is an artist in New York; her work was exhibited at Cheim & Read, Gavin Brown's enterprise, Sperone Westwater, The Journal, and Regina Rex. In 2018, she has exhibitions coming up at Yossi Milo Gallery, New York; Aspect/Ratio, Chicago; and Galleri Thomassen, Gothenburg, Sweden. Her work has been discussed in The New York Times, New York magazine, Art in America, and The Brooklyn Rail. She teaches at Pennsylvania Academy of the Fine Arts (PAFA), Hunter College, and Columbia University. This Fall, she will serve as acting head of the painting department at the Cranbrook Academy of Art. Margaux Ogden lives and works in Brooklyn, New York. Recent solo exhibitions include Space Never Moved at Rental Gallery, East Hampton (2018), Nothing Had Yet Been Sacrificed at Embajada, San Juan (2016), Chekhov's Gun at LTD, Los Angeles (2015) and Down the Rabbit Hole, Freight & Volume, New York (2015). Her work has been featured in the Los Angeles Times, Modern Painters, Artinfo, Art Critical, Cultured, and the Paris Review Daily. In 2018 she received the Pollock-Krasner Foundation Grant. She was in residence at Yaddo in 2017, and at Skowhegan in 2011. She has an MFA from Boston University, a post-baccalaureate from Brandeis University, and a BA from Bard College.